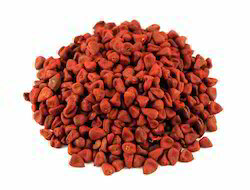 - The red color of annatto seeds and the pigment extracted from them is due to the carotenoid content of those seeds. - Over time, carotenoids break down, so only buy annatto seeds if they are bright orange or red. It is often used to impart a yellow or orange color to foods, but sometimes also for its flavor and aroma. We offer the finest quality from Annatto Seeds in the national market. The Red Annatto Seeds made available by us are used to treat a number of food stuffs for adding artificial colors in them. They are extracted from the best sources of the annatto seeds. Besides, we are one of the most important Natural Annatto Seeds Manufacturers and Suppliers in the country. We offer the finest quality from Annatto Seeds in the national market. The annatto seeds made available by us are used to treat a number of food stuffs for adding artificial colors in them. They are extracted from the best sources of the annatto seeds. Besides, we are one of the most important natural annatto seeds manufacturers and suppliers in the country. Owing to the wide experience in this domain, we are instrumental in offering Annatto Seeds to our clients. Heritage Bio-Natural Systems Pvt. Ltd.
Annatto is used both as a spice and a dyestuff. It may be better known to Mexican and Latin markets as achiote or in the Philippines as atsuwete or achuete. In the West it used to colour confectionery, butter, smoked fish and cheeses like Cheshire, Leicester, Edam and Muenster. It provides a bright and exotic appearance for many kinds of dishes. Rosun Natural Products Pvt. Ltd.